TigerCool is perfect for use in your home's outdoor areas. Created by TenCate, a worldwide innovator of space-age yarns for NASA and Boeing, TigerCool yarns are engineered with heat reflective colour pigments and advanced U.V. inhibitors that reduce surface temperatures. A series of solar panel tests indicate that artificial grass featuring TigerCool technology successfully reduces turf temperatures by 15% and up to 10 degrees Celsius! That’s a difference that you can feel. Don’t let the heat interfere with your life. TigerCool makes any outdoor event a cool and pleasant experience. It’s perfect for any front yard, backyard, commercial property, public park, or municipality. Like all of our turf products, it’s safe for children and is pet-friendly! 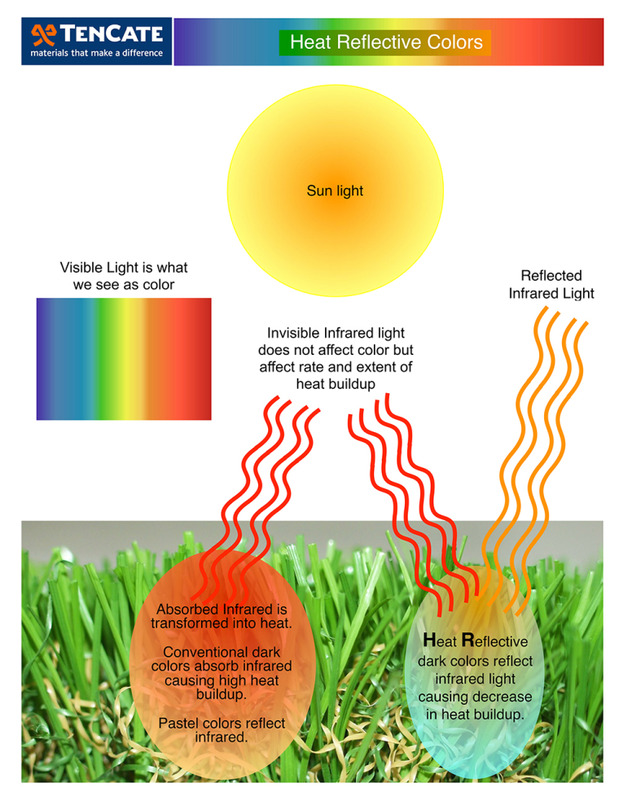 The dark colour of conventional synthetic turf absorbs infrared light which is transformed into heat. This is the same process that occurs on any dark surface like decks, dark paving, rubber matting or asphalt. TigerTurf’s TigerCool artificial cooling technology uses heat reflective colour pigments in the yarn manufacturing process which, when tufted into a synthetic turf, reflect infrared light causing a decrease in heat build-up. What TigerTurf Products use TigerCool? TigerTurf are introducing two new products within its landscape range that incorporates the TigerCool technology, Serenity 30 and Serenity 40. Both Serenity 30 and Serenity 40 are a soft landscape grass that is cooler than many synthetic grasses by up to 15%. Serenity 40 (40mm pile height) is a longer pile, denser product providing a lush, well maintained lawn. Serenity 30 (30mm pile height) has a shorter pile with more of a freshly mown grass appearance. Both have the added benefits of being olive green replicating a natural lawn and de-lusted so you don’t get that shiny look. Serenity is manufactured from 100% polyethylene monofilament giving it a softer, smoother texture and elasticity. Another distinct advantage offered by polyethylene fibre is that it has a waxy, almost damp feel, which is pleasant on your skin. Monofilament fibres are, by nature, more durable than the alternative, fibrillated fibres. They are extruded as individual filaments during the manufacturing process to predetermined shapes and thicknesses. The fibres have better vertical memory which means they bounce back to their original shape and so maintaining its natural grass look. A stunning alternative to natural grass, Serenity is soft under foot so perfect for the front yard or backyard installation. And it comes with a 10-year Manufacturer’s warranty. For more information on TigerCool, visit TigerTurf's website.